Once we put a deposit on our new pet mini pig, we had a week to get everything prepared for his arrival. 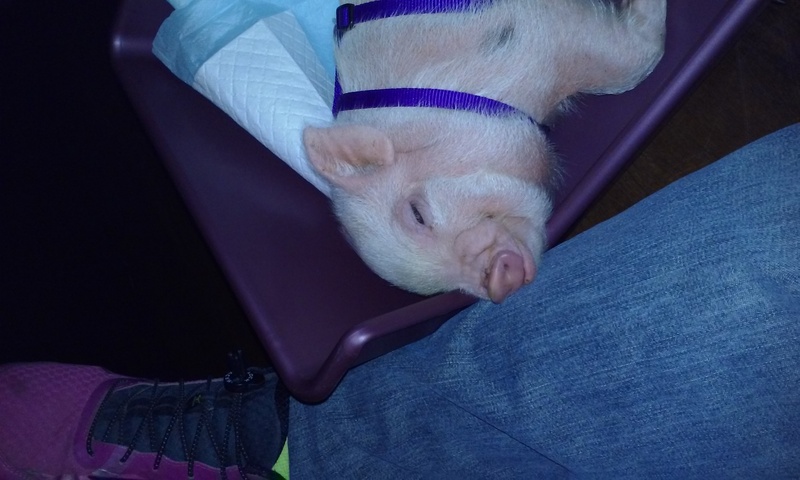 This was a hectic week since I had no idea what a mini pig needed to be comfortable and happy. We went through some trial and error and bought a few wrong things before stumbling upon what worked best. Here is a list of the items we found most useful for starting out with Oscar. 1) Food and water bowls. Mini pigs like to flip their food and water bowls over. You can try training them to not do this, but it’s easier just to find bowls with the right shape and weight to make flipping difficult. Start with heavy, larger bowls that they can still drink and eat out of while young but that they can also grow into. Those tiny bowls at pet stores are cute and tempting, but they will be upside down in no time leaving you with a mess and needing to buy new bowls (I found this out the hard way). Even when mini pigs are young, their snouts are strong. We ended up with these bowls from Target and took the bottom rubber part off since it was trapping water and spilling a bit. These aren’t perfect, but they are working better than others we tried. 2) Blankets. Mini pigs love blankets, so buy several. Since I knew they would get dirty at first, I searched for soft, large blankets on sale or clearance and made sure they were easily washable. Some of them have held up well and others, well, needed to be thrown out due to accidents. You can buy your piggy some nice blankets eventually, but I recommend starting out with some that you aren’t overly attached to. 3) Bed. I had a hard time deciding what type of bed to get little Oscar. I wanted it to be perfect, and I picked one with a cupped shape. The sides come up pretty high on it and, once he’s in, he sleeps comfortably. The problem with the bed is that his little legs can’t crawl into it. If we place him in, he’ll generally stay but he rarely manages to get in on his own. After all of my searching for the perfect bed, he prefers the dog bed that’s low to the ground and easy to step onto. My recommendation is to find one that’s easy for the pig to get into and easy to wash. Frankly, Oscar prefers his big, fluffy Sherpa blanket to any of the beds, so you could go that route as well. Update: We finally found a bed that Oscar loves, and I talk about why he loves it here. Oscar having a hard time getting into his bed. 4) Crate. I love the crate we bought Oscar . His crate opens in the front and on the top which has been really helpful. When I take him places, I can keep him in the crate securely and open the top to pet him or let people see him if they ask. If I forget to put his favorite blanket in the crate at night, I can just open the top and put it in rather than opening the front and having to deal with a piggy trying to push his way out. It’s also easy to put together and clean. We bought this Petmate Two Door Top Load Kennel. 5) Play Pen. This is probably my favorite purchase of the ones we made for Oscar. The play pen allowed us to keep Oscar contained (to avoid accidents, running amok, etc) while also being near the family. He has plenty of room to move around with a bed and some toys, and he can see out so he doesn’t feel alone (which limits the squealing a bit). The play pen is light which makes it easy to move from room to room; it also travels well which is great for taking Oscar to grandma’s house. From experience, cleaning it isn’t fun but works enough that I feel like it recovers well from accidents. 6) Litter Box and Puppy Pads. We initially planned on using a litter box, so we bought one along with some puppy pads. 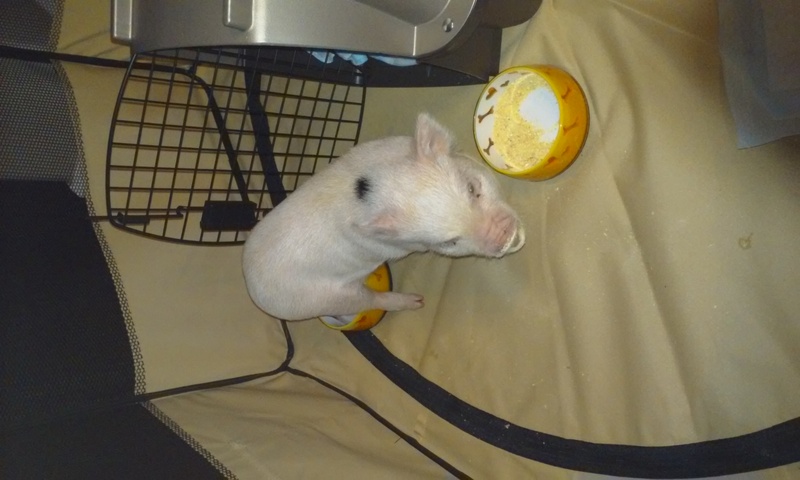 We ended up not using the litter box, but many pig parents do and find it’s a great potty training solution. We bought a ferret litter box which was recommended by other mini pig owners because it has a lower front side and is easier for a pig to step into. Also, we didn’t want to deal with cat litter (and the clumping kind can be dangerous for mini pigs because they like to eat everything…), so we bought some puppy pads to place inside the box. 7) Harness. I’m still working on finding the right harness for Oscar. We have tried both the step-in and the over-the-head kinds and cannot find a perfect fit. Most people recommend the step-in kind for pigs but we have had a few slip outs with those and are using the over-the-head kind for now. If you are looking for an over-the-head harness to try, we have had good luck so far with Top Paw dog harnesses from Petsmart. With the use of some treats, Oscar is getting better about putting his harness on and taking it off, but it’s still a challenge. You will notice in pictures that our little boy mini pig has purple and pink harnesses; we have been using our dog, Rylee’s, old harnesses until we can find the best one for Oscar. 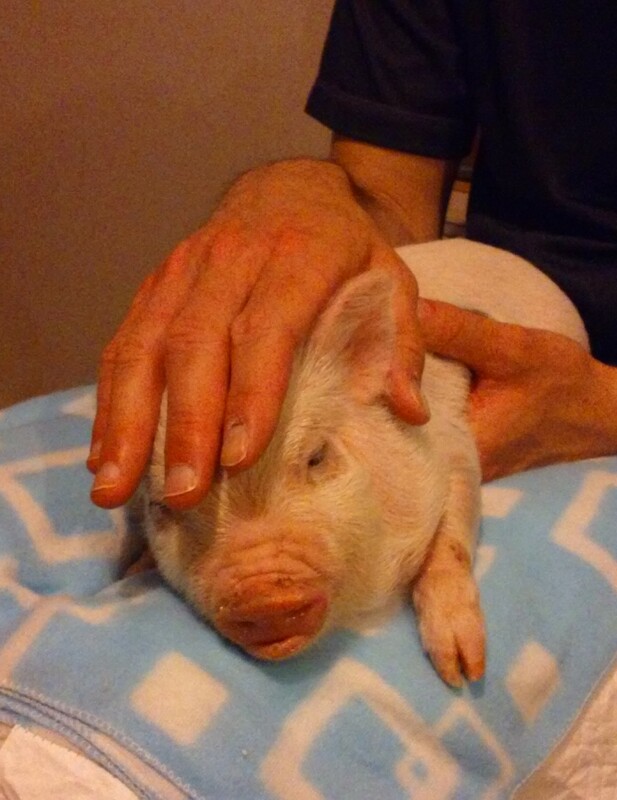 My advice: find the kind that you and your mini pig are most comfortable with and go with that. Once Oscar is a little older and isn’t growing so quickly, I might invest in one of the harnesses made for mini pigs and see how that goes. Here is a video (featuring Oscar!) 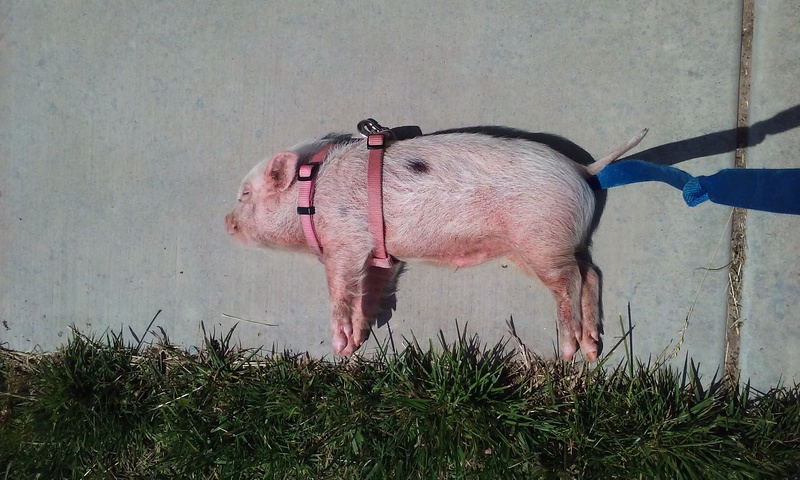 about how we learned to put a harness on our mini pig. 8) Cleaning Products for Accidents. 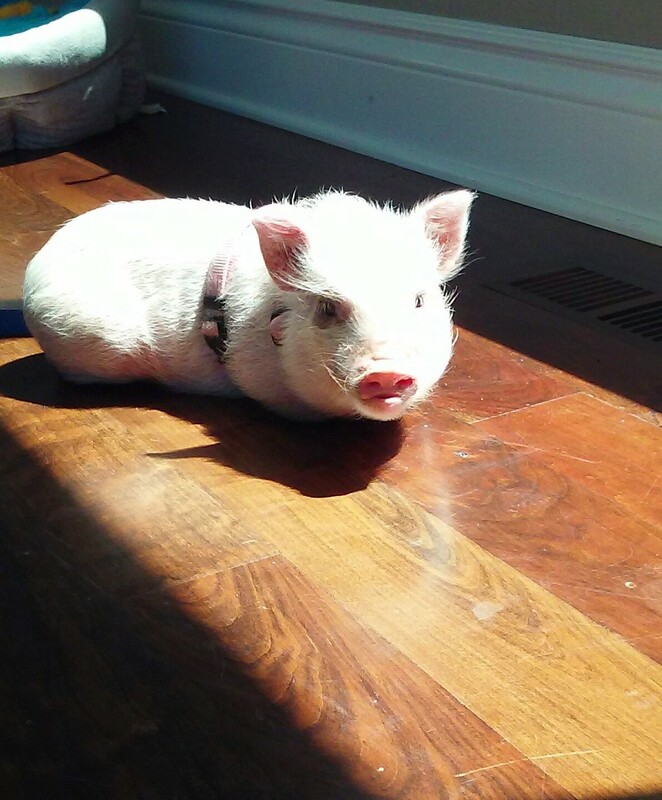 I recommend having pet cleaning products at home when your mini pig arrives. It’s important to make sure the products you choose clean up the accidents completely, including any odors, so that your mini pig doesn’t have repeated accidents in the same spot. Here is a list of of the cleaning products we use for our mini pig’s accidents. Those are the items we bought to get started with little Oscar. 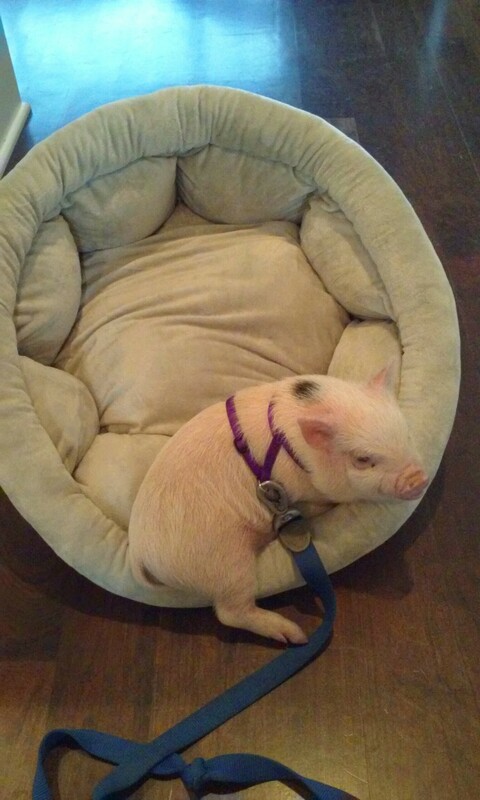 As he has grown, we’ve found other items helpful, such as treats, toys, and a bean bag chair; however, the items above should be sufficient for starting out with a mini pig. Since there aren’t a ton of items on the market made specifically for mini pigs, we had to try and adapt dog, cat, and other animal items to work. Different items may work better for your family and your mini pig. However, if you’re looking for some items to get started, these are ones that we have tested and worked for us and Oscar. During my mini pig research, I read over and over that mini pig potty training is easier than potty training a dog, but I was skeptical. I have potty trained two dogs, and one was a nightmare (I’m looking at you, Rylee) and the second dog was a little easier since he followed Rylee’s lead and learned to use the dog door quickly. I wasn’t going to be fooled by thinking that potty training a mini pig would be easy and then be angry and frustrated later. Nope, I prepared for the worst: sleepless nights, constant crate cleaning, surprises of unexpected accidents in random places in the house. As it turned out, potty training Oscar was much easier than potty training my dogs. In fact, we really didn’t have to potty train him. From the day we brought him home, he preferred to go outside instead of in the house. 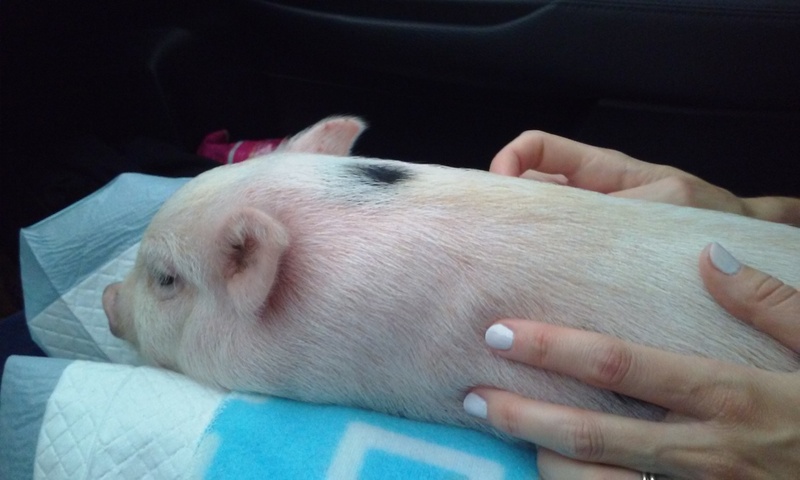 Since pigs prefer to go to the bathroom in the same spot (sometimes uncomfortably so), we picked a spot for him outside and took him there each time we went out. That doesn’t mean we didn’t have accidents to clean up, but they weren’t due to Oscar not knowing where to go. Most have been our fault and just needed adjusting our strategy. We ran into two main issues. Consistency: Young piglets can’t completely hold their bladders until they are older, so getting Oscar outside consistently and frequently enough and at the right time was a challenge. Unlike our dogs, Oscar won’t go a little each time we take him out. Instead, he likes to hold off until he really has to go and then goes all at once. What this meant for us is that we could take him out three times in a row with no result and then the fourth time he would go because that’s when he really needed to. This has been frustrating at times, but the issue vastly improved once we figured out the pattern and adjusted our process. The key for us was getting him out every hour or two knowing that sometimes he would go and sometimes he wouldn’t, but we needed to give him the opportunity. The alternative is that he wouldn’t be able to hold it any longer at some point and would pick a spot in the house. Frequency and consistency in taking him out was key. Meal Time: We soon realized that most of Oscar’s accidents happened within an hour after meal time. He would pee two or three times in the house after a meal which we figured out was due to drinking too much water too quickly while eating. In my research, I read how it’s important for piglets to have access to fresh water at all times, but having it available for him at meal time didn’t work. He would go back and forth between his food and water bowls every few bites and take in too much water which was causing the bathroom problems. So, we found some fun and different ways to feed him or just put a little water in with this food pellets and then made sure he had access to his water bowl at all other times. I know a litter box is a great solution for mini pigs and their families, but we ultimately chose to not go that route. My husband is not a fan of odors in the home and preferred we stick to outside, and I’m home to take Oscar outside frequently so we didn’t need an indoor option. That’s also good because we tried a litter box the first night, and Oscar preferred to use it as a sleeping box. Oscar sleeping in his litterbox. Oscar asleep in his litterbox.